﻿Students needing ﻿notarized transcripts﻿ should contact the Office of the University Registrar at registrar@chapman.edu or (714) 997-6701. Notarized transcripts should not be ordered online. Chapman University has authorized Credentials, Inc. to provide transcript ordering services on its behalf. The Office of the University Registrar releases academic record transcripts in compliance with the Family Educational Rights and Privacy Act (FERPA) and issues official transcripts only with a signed permission from the owner of the student record. A one-time consent form to release your transcript may be required. Requests for official transcripts from students with outstanding financial obligations to the University cannot be completed. Check for holds in your Student Center by logging in to my.chapman.edu prior to submitting an order for transcripts. To clear financial holds, contact the Business Office at (714) 997-6617. Learn more about Business Office Hold. 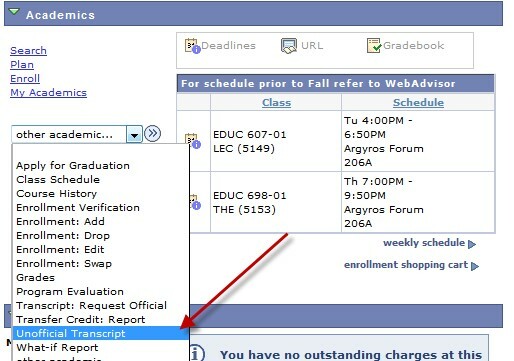 Current students should request their transcripts through My.Chapman.edu by selecting "Transcript: Request Official." Pay for your order using any major credit card. Save the order number received at the end of your transaction to track your order. Transcripts are $10.00 each. The Mail and Fax/Mail deliveries will be sent out from Credentials Solutions via First-Class U.S. mail. Rush/FedEx delivery is available for an extra $25.00. FedEx cannot be mailed to P.O. Boxes and will require signatures for delivery. Tracking number will be provided to the order once the order has been sent. Hold for Pick-Up at the Office of the University Registrar, is on Monday - Friday, 9 a.m.- 5 p.m..
An option is available to add attachments to your order via the official order form. Students with HOLDS on their Chapman University academic records will be unable to access Unofficial Transcripts. Contact the appropriate departments to resolve and clear all holds. Click on the Student Self Service link, then Student Center. Under the Academics bar, select Unofficial Transcripts from the pull-down menu. From View Unofficial Transcript screen, select Unofficial Transcript option for the Report Type, then click on View Report. To ensure the unofficial transcript will open in a new window in pdf format, turn-off pop-up blockers prior to viewing report. Email registrar@chapman.edu your request for unofficial transcript using your Chapman University issued email address only. Requests from Non-Chapman University email addresses will be directed to order official transcripts through Credentials Solutions. To obtain your Chapman University email password, please contact the Service Desk at (714) 997-6701. Transcripts for Brandman University or University College students from Catalog years 2010 or later are ordered through Brandman's Student Self-Service website. Brandman University issues Official transcripts only with a signed permission from the owner of the record. A one-time consent form to release your transcript will be generated from your order to be returned to Brandman by fax, mail, or email attachment. Students who need their official transcripts to be notarized must fill out the Notary Request Form. If you need to order official transcripts to be notarized, please contact the Office of the University Registrar at registrar@chapman.edu or (714) 997-6701. Do not order the transcripts online if a notary is required. For more information regarding the notary process, please see the FAQ section below. A notarization is verification that a document is authentic. Do I need my transcripts or diploma notarized? Typically international students or students applying for employment or higher education in a different country will need a notarized diploma or transcript to submit to the California Secretary of State to obtain an Apostille. The Office of the University Registrar can only notarize documents that it provides. If a third party requires a notarization, they will let you know. How do I get my diploma or transcripts notarized? Contact conferral@chapman.edu to set up an appointment time with the Diploma Production Specialist and the Notary Public. Only original documents can be notarized; copies or scanned documents are not accepted. Bring the official transcripts or diploma to the Registrar’s Office at the designated appointment time. What if I don’t have my original diploma? You can request a duplicate diploma by submitting the request found on the Registrar’s Forms website. Please note that the processing and printing time for duplicate diplomas is estimated at 4-6 weeks. What if I don’t have my official transcripts? Students needing notarized official transcripts should contact registrar@chapman.edu to arrange for transcripts to be notarized and mailed. Students may also order transcripts in person at our office and have them notarized. However, an appointment time will need to be scheduled by emailing registrar@chapman.edu for the Notary Public. According to the California Secretary of State website, an Apostille is a certificate that authenticates the origin of a public document. Apostilles can only be issued for documents issued in one country party to the Apostille Convention and that are to be used in another country which is also a party to the Convention. See the Secretary of State website for further information- http://www.sos.ca.gov/notary/authentication/. Where do my documents need to go after they are notarized? If the documents need to be sent to the California Secretary of State for an Apostille, the student can send all required documents to the Secretary of State themselves. Our office does not coordinate the Apostille process. You’ll need to contact the Secretary of State office for further questions regarding the Apostille process.